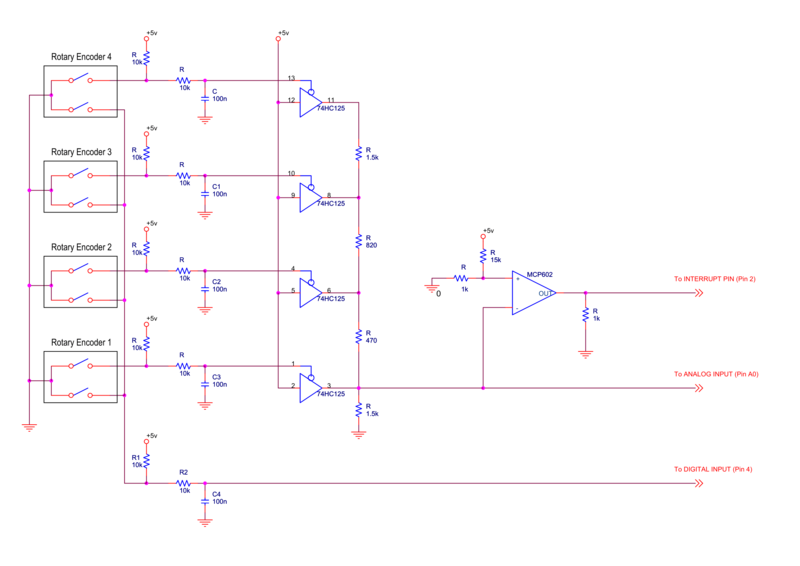 I would like to share my personal HW/SW solution that allow to decode 4 quadrature encoders using only 3 processor's I/O: one external interrupt, one analog input and one GPIO. It uses only a simple external HW circuit and it's based on external interrupt routine (no polling), using only one external interrupt input. The solution doesn't use external library, serial communication protocols or complex data manipulation so it's a valid alternative to the use of more complex solutions and save space and processor's resources for integration of further functionalities. * one analog input and one GPIO (in this example digital pin n.4 is used, but an analog input could be used indifferently). * The encoders are connected in parallel through a voltage divider that provides interrupt signals at a specific voltage for each encoder. * Depending on the interrupt signal voltage the microprocessor identifies the "active" encoder. * After the voltage divider the signal is normalized again to 0-5V to be used as interrupt signal. * The system works only with encoders with detent (both encoder contacts normally open or closed). * - variable for encoders direction reading (dir).